Watch the concussion video, then complete the online application or the mail in application. Register your team with US Amateur Basketball. Click on the Sign Up button. Then come back to this page and complete your application. Background checks are run on all applicants. Applications are not accepted at tournaments. 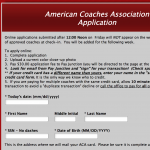 Be sure to include a current color photo to identify you and the application fee with your application. Pictures with hats or any part of your face or head missing will be rejected and cause delays in receiving your card. We will not accept your driver’s license as a photo.